I received copies of the first two books in a new series called Race the Wild by Kristin Earhart quite by surprise. I hadn't requested them and they were sent without inquiry. As I've mentioned before though, I'm having a hard time keeping up with Bookworm1's (age 8) reading and I was delighted with the surprise of these books as I thought they would be right up Bookworm1's alley. I asked him if he'd be interested in reading them and he said he would. Before he did so though, I previewed the first title. Below you'll find our combined thoughts on this series. Mom's general thoughts: I skimmed the first book completely through before allowing him to read them. (This took me a grand total of 20 minutes max.) The premise of the book is that there are a group of kids that sign up to run a race around the world. The children are formed into teams and they compete against each other as they attempt to complete courses taking them all over the globe. Along the way they learn about geography and the animals which inhabit the various lands. There are to be additional titles available in this series. Mom Concerns: the children sign up for this adventure which is clearly a set up for a reality tv show (although that doesn't seem to be made explicitly clear). They have guides which stay with them (the adult supervision necessary!) but who, of course, do not advise or counsel. They are just there to keep an eye on things. I don't really think very much of the set-up but I also knew that the concept of a reality show was going to go right over Bookworm1's (age 8 1/2) head and so I didn't necessarily mind him reading it. I wouldn't continue to suggest such titles as he grows up, but for now I think it's fine. The book is mostly about animals and adventure from his perspective and I won't begrudge him that. My only other "concern" isn't a very strong one. The kids happily wave goodbye to their parents and occasionally reference the fact that if their parents knew what they were doing on these adventures, they'd be terrified for their children's safety. They don't seem to talk about their parents in a disrespectful way, per se, but it's verges on it. I didn't see their attitudes as being blatant enough to raise it as a topic of discussion with my bookworm but I'd just as soon authors take great caution when having the younger characters speak of or reference the adult characters. As I say though, the issue wasn't glaringly obvious enough for me to want to address it because I also know that he isn't the type to take great notice of that or have it effect him negatively unless it's really obvious. And it wasn't. This series is about a race that the children were trying to win. They were in a race and they had to figure out clues about an animal and then take a picture of that animal. Then they got to move on to the next thing. 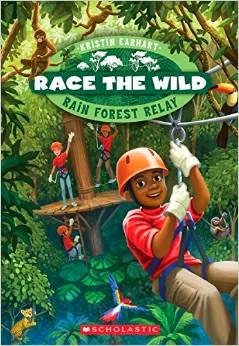 The first book is Rain Forest Relay . In this book, the children were in a rain forest and they had a boat that they got to ride in while they were finding their clues. They got all of the clues and the red team came in first place. This book was pretty exciting because the red team was trying to get their clues really fast because the green team was in front. Then the red team came in first place because although the green team made it to the finish line first, they did not know the answer to the last clue. I read this book really fast. 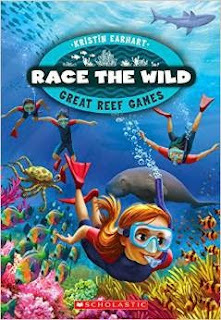 The second book is called Great Reef Games . In this story I read about the red team and the purple team. The red team got to get a head start because they came in first place in the last book and they had three other people to help them. Two people on the red team got to ride a parasail and look for whales. They worked hard to find clues. For the second clue they were required to take three pictures of symbiosis - (interjects, "I think that means something helping another thing.") - and they got two but they messed up on the third one. Finally they got the third picture and then they went on with the cruise and got second place. Purple team got first place and that's the end of the book. Would you recommend this series of books to other kids? I think so. How old do you think someone should be before they read these books? They should be old enough to read The Boxcar Children Books. Was there anything scary in the books that you would warn others about? No. Was there anything troublesome/worrisome/bad in the books that you would want me to know about? No. Do you want to read the other books in this series? Yes. Race the Wild #3: Arctic Freeze is due out later this year. Many thanks to Scholastic Books who sent the above titles our direction in order to facilitate this review. We received no additional compensation and all opinions are our own.